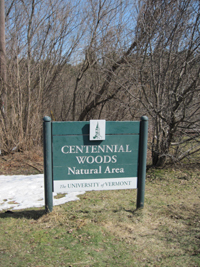 Resources about UVM's Centennial Woods Natural Area for students, researchers and visitors. Centennial Woods Natural Area is part of a larger wooded area that straddles the Burlington-South Burlington city line. It is is one of the University of Vermont's nine natural areas, and is managed by the UVM Environmental Program. Development rights have been transferred to the Vermont Land Trust. Centennial Woods Natural Area contains about 70 acres of mature conifer stands, mixed hardwoods, fields, streams, and wetland areas. Adjacent to the UVM campus, it serves as an excellent natural laboratory to study the region’s plants, animals, and natural processes, as well as cultural history. A well developed trail system wanders through Centennial Woods, offering visitors samples of the natural communities and landscape features thriving here. Students in environmental studies, botany, zoology, forestry, recreation management, and education use it extensively for academic study.